Katie McLaughlin ’15 teaches a WesBAM! class called Vinyasa Flow Fusion, which combines meditation, breathing techniques and traditional asana practice for whole body health and happiness. Q: Katie, what are you majoring in? A: I’m majoring in French and environmental studies with the certificate in international relations. For my capstone project in the environmental studies major, I am researching the academic justifications of contemplative pedagogy and developing a curriculum which integrates it and movement-based learning into elementary school, high school and adult education. The goals of the curriculum are to explore the environment through physical inquiry and embodiment, reevaluate the ways we perceive ourselves as a part of, or apart from nature and reexamine how we interact with ourselves, our communities and the spaces we inhabit. Q: You are a WesBAM! manager and yoga instructor on campus. Please explain what WesBAM! is all about. A: Started by Renee Dunn ’14 and Shira Engel ’14, Wesleyan Body and Mind (WesBAM!) is a student-run organization that makes mind-body awareness and fitness accessible at Wesleyan by offering a wide variety of daily classes, free community classes every weekend, and free workshops throughout the semester. WesBAM! instructors are students certified in a variety of athletic disciplines. 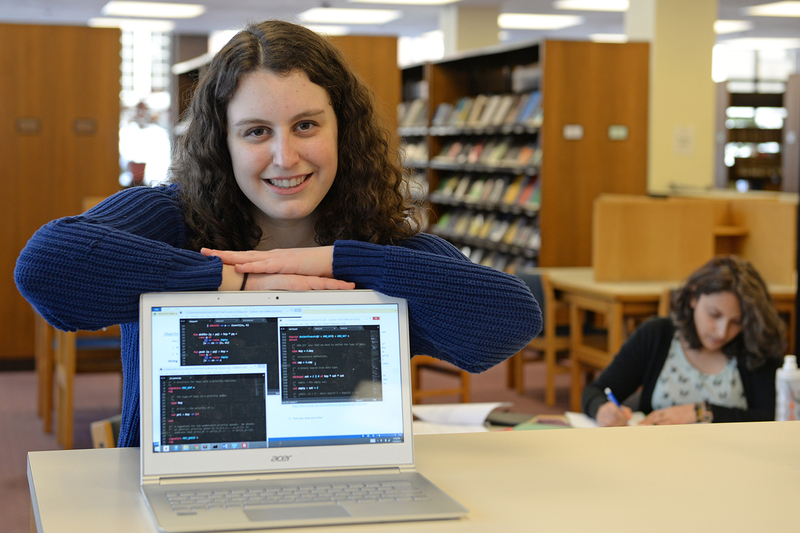 As a service-learning project, Alicia Gansley ’15 helped create a web application for the Green Street Teaching and Learning Center. Gansley enjoys writing programs from the comfort of the Science Library. “This is where you’ll usually find me,” she said. Q: Alicia, what are you majoring in? A: I’m majoring in computer science and I’m also completing the economics minor and Civic Engagement Certificate. Q: Last fall, you brought your programming knowledge to COMP 342: Software Engineering, a service-learning course where groups of computer science majors develop special projects for local organizations. Tell us more about your project. A: My group made a web application for Green Street Teaching and Learning Center to use to sign students up for one of its after school programs. Our system will allow Green Street to collect students’ contact information and course preferences, as well as allow the staff to keep track of this information throughout the semester. Q: How did the experience of working on a project for an organization differ from working on a project for a typical academic course? Were there unexpected rewards and challenges that came with having a client? A: It was a real pleasure working closely with Sara MacSorley at Green Street and learning more about their facility and programs. Part of what struck me about working on a project for a client was the fact that you can never just say “90 percent is enough.” We needed to always figure out some way to meet their specifications, which I think pushed the team to really learn and work together. He loves “chick-flicks” and played alto-sax in high school. But he also wants to earn a spot in the Special Forces after graduation. In short, the Cardinals’ No. 80 in football has many layers. They all start and end with respect, and comfort in being himself, on and off the field. 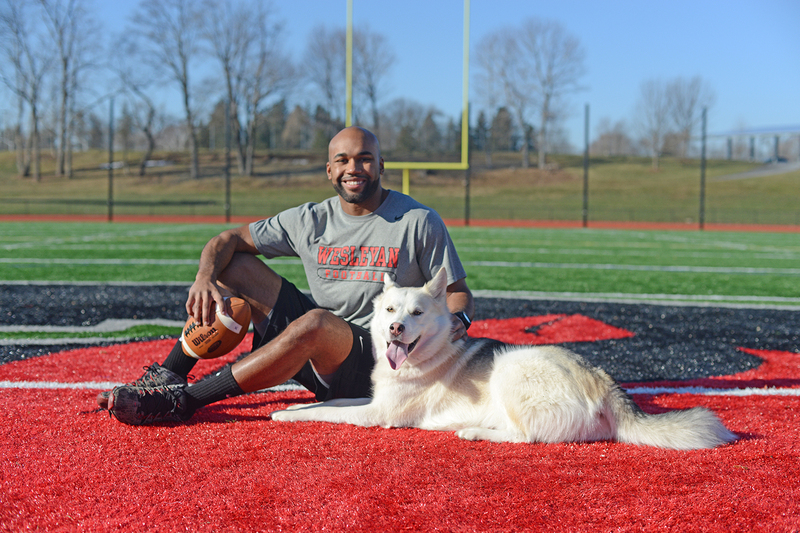 He’s no prima donna, even though he has only played one position since he was 9 — wide receiver. Being a distraction to the team is not in his DNA. Rex Bernstein ’15 died peacefully in his sleep Jan. 10 while visiting family in the San Francisco Bay area. He was pursuing a government major at Wesleyan with a minor in history. 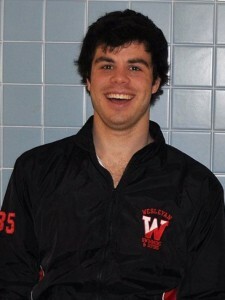 He was a former member of the Wesleyan swim team and a member of Beta Theta Pi. Bernstein, 22, was “a large person with a large personality, and he will be missed by many here on campus,” wrote Dean Mike Whaley, vice president for student affairs. Bernstein is survived by his parents and younger sister, Olive, and his dog, Gato. View Bernstein’s guestbook online here. A memorial service is being planned by the Office of Religious and Spiritual Life. A paper co-authored by molecular biology and biochemistry major Holly Everett ’15 is published in the December 2014 issue of Nature Communications. The article, titled “High-throughput detection of miRNAs and gene-specific mRNA at the single-cell level by flow cytometry,” describes a novel approach to visualizing RNA and protein simultaneously at the single cell level. Everett has been working on the accompanying research at the Ragon Institute of Massachusetts General Hospital, Massachusetts Institute of Technology and Harvard. This new technology uses gene-specific probes and a signal amplification system based on a “branched DNA” principle. The authors show that this novel flow-FISH (for “Fluorescent in situ hybridization”) technique is sensitive, specific and can be multiplexed with simultaneous detection of three different gene-specific RNAs. The results further demonstrate their ability to measure expression of genes critical for immune cells, such as cytokines, in white blood cells specifically targeting the HIV or CMV viruses. The authors also demonstrate the capacity to detect mRNAs for which flow antibodies against the corresponding proteins are poor or are not available. Read more about the study online here. Everett, who is completing her degree in three years, worked on this study between her sophomore and senior (gap) year, starting in 2013. She hopes to continue this research next year at a HIV and TB research institute in Durban, South Africa. Everett’s advisor is Don Oliver, professor of molecular biology and biochemistry, the Daniel Ayres Professor of Biology. In this Q&A meet Colin Russell from the Class of 2015. Q: Colin, what are you majoring in? What have been your most instrumental courses so far? A: I am majoring in neuroscience and behavior while also on the pre-medical path. Two of the most instrumental courses in my journey through Wes have been Organic Chemistry and the Organic Chemistry Lab that is paired with the lecture course. The reputation of Organic Chemistry was extremely intimidating prior to taking the course, and I was nervous that I would not like this subject that is the basis for so much of the biological world. However, I soon learned that I enjoyed the structure of subject, not just in the way it was taught, but in the way that my brain began to process information. The concurrent lab course, while extremely difficult, also allowed for hands-on application of the processes and reactions that we were learning in the lecture class. I enjoyed the course so much that I became a Teacher’s Assistant for the lab, and I will be starting my fourth semester as a TA for the lab in the spring. Not only has the information from these two courses been crucial for my studies, but the process of meeting the challenges of these two classes has also been extremely important in my academic journey. Q: You’re currently a Senior Interviewer in the Office of Admission. Please describe that role. 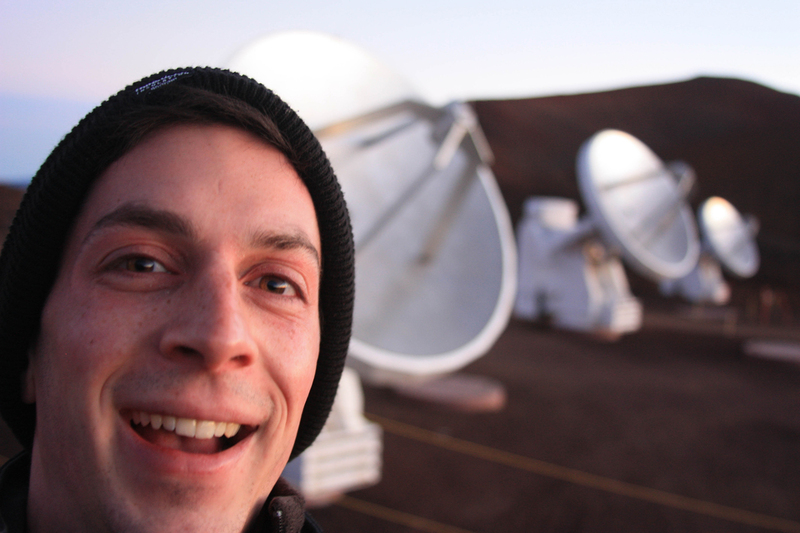 Jesse Lieman-Sifry ’15 visited the Sub Millimeter Array in Hawaii this summer to help observe, learn about how radio astronomy data is collected, and see the array of antennas up close. 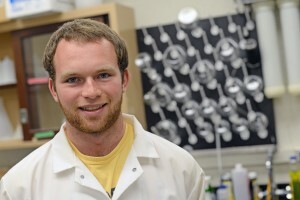 Lieman-Sifry recently received a $5,000 Undergraduate Directed Campus Scholarship from the Connecticut Space Grant Consortium to support his ongoing research on gas planet formation. 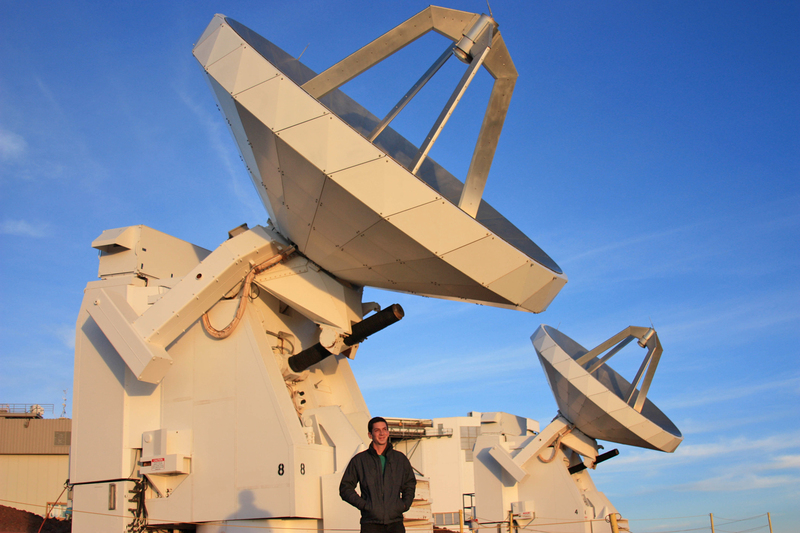 For the past year and a half, Jesse Lieman-Sifry ’15, an astronomy and physics double major, has focused his undergraduate research on understanding the formation of gas planets. This month, Lieman-Sifry received a $5,000 Undergraduate Directed Campus Scholarship from the Connecticut Space Grant Consortium, funded by NASA. The award will be applied to his financial aid package and support his ongoing research in the Astronomy Department. Jesse Lieman-Sifry uses data to model the dust and gas on a specific star system called 49 Ceti. 49 Ceti is visible to the naked eye. Planets form in disks of gas and dust left over from the formation of a star. For gas planets, such as Jupiter, Saturn, Uranus and Neptune, a massive rocky core must solidify before accumulation of gas can begin. Q: Angela, where are you from and why did you choose Wesleyan to further your education? 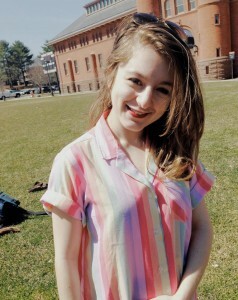 A: I am from Nanuet, New York but I went to a boarding school called Phillips Exeter Academy. I chose Wesleyan because I was intrigued by how people were given the freedom to pursue their interests, no matter how different these interests might be. I was also attracted by the collaborative atmosphere and how people seemed to encourage and support their peers. Q: What are you majoring in? A: I’m double majoring in chemistry and English, and I hope to write a thesis on non-beta lactam inhibitors of beta-lactamses. This entails synthesis of potential inhibitors as well as investigating the efficacy of these compounds through enzyme kinetics. I have been working in Professor Pratt’s lab in the Chemistry Department since sophomore spring. I chose to also pursue English because I was really interested exploring the different stories that people tell, the various ways in which they tell their stories and how we understand them. Q: You’re currently the co-coordinator of a tutoring program called WesReads/WesMath. Tell us a bit about this program. A: WesReads/WesMath allows Wesleyan students to tutor at two different local elementary schools. More than 70 Wesleyan students volunteer through the program and we help teachers with classroom activities or work with a small group of advanced learners on a math or reading curriculum that we developed or organized. This month, five Wesleyan students received Summer Experience Grants, supported by the Patricelli Center for Social Entrepreneurship. The honor comes with a $4,000 stipend to supplement costs associated with a summer internship experience. The grants are available for Wesleyan sophomores and juniors currently receiving need-based financial aid who plan to do socially innovative or socially responsible work during summer break. The recipients include Theodora Messalas ’15, Dara Mysliwiec ’16, Keren Reichler ’16, Geneva Jonathan ’15 and Jared Geilich ’15. In addition, film major Aaron Kalischer-Coggins ’15 received a Priebatsch Internship Grant. All grantees report on their experiences on the Patricelli Center’s ENGAGE blog. Sociology major Theodora Messalas is working with a food pantry, soup kitchen and women’s homeless shelter called Crossroads Community Services in New York City, exploring ways to implement successful social services in which the needs and preferences of the end-users are paramount. Jack Singer ’15 holds a fragmented lunar sample (Apollo 12039,3), a crucial sample for studying his mineral of interest — apatite — on the moon. 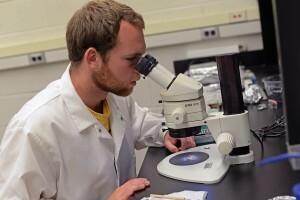 This summer, Singer received a Connecticut Space Grant College Consortium grant to fund his summer research in the Earth and Environmental Sciences Department. 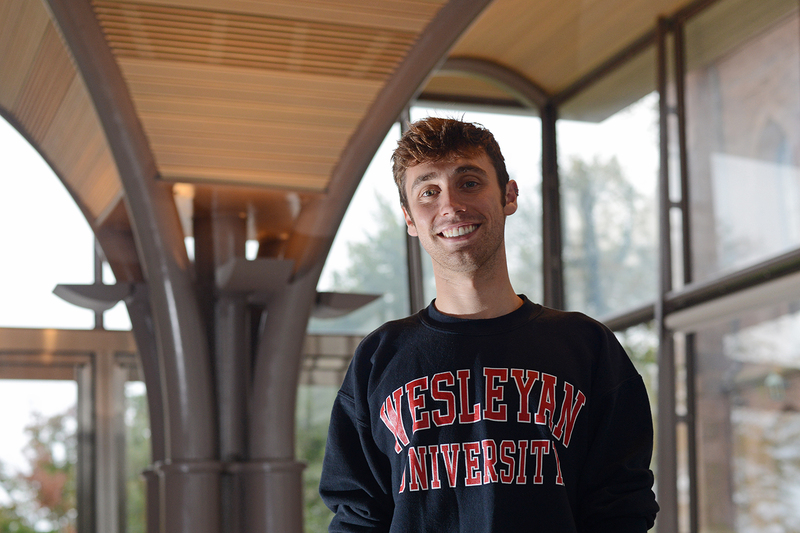 As a recent recipient of an undergraduate research fellowship, Jack Singer ’15 is spending his summer at Wesleyan studying the geochemical evolution of the moon. The fellowship, supported by the Connecticut Space Grant College Consortium, comes with a $5,000 award. Grantees are expected to work on research related to space/aerospace science or engineering under the guidance of a faculty member or a mentor from industry. By using a microscope in Wesleyan’s Solar Systems Geochemistry Lab, Jack Singer takes a closer look at a lunar sample. For the next three months, Singer will work on various research projects with his advisor James Greenwood, assistant professor of earth and environmental science. Singer will first prepare a fragmented lunar sample (Apollo 12035,76) for analysis under an ion microprobe. An ion microprobe applies a beam of charged ions to the sample and helps determine the composition of the material. This rock contains olivine, a mineral that is mysteriously sparse in many different lunar samples. “By analyzing the melt inclusions contained within olivine in this rock, I’ll be able to better understand geochemical evolution of the moon,” Singer said. Singer’s second project is more experimental. He’s attempting to model and quantify diffusion in a late-stage lunar environment (one of the last regions to cool on the moon) by synthesizing a granite-rich model lunar glass. Singer will heat this glass past its melting point and place it in contact with solid terrestrial apatite — the Moon’s major water-bearing mineral — and measure how elements diffuse across the glass-grain (or solid-liquid) boundary. Jack Singer and his advisor, James Greenwood, will travel to Japan this summer to use an ion microprobe at Hokkaido University. “This type of analysis helps us to better understand the processes that occurred during the last stages of lunar cooling,” he explained. 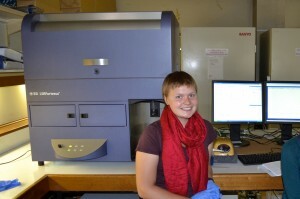 In addition, Singer and Greenwood will travel to Japan this summer to use an ion microprobe at Hokkaido University. 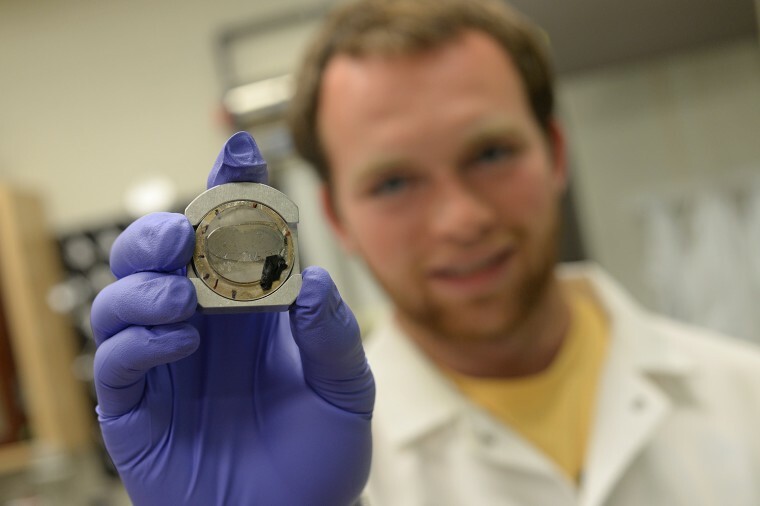 “This machine allows us to analyze and measure stable isotope ratios in the minerals we are interested in, and can therefore tell us something about the fractionation and geochemical history of the lunar body,” Singer said. Next fall, Singer will write about his research findings. 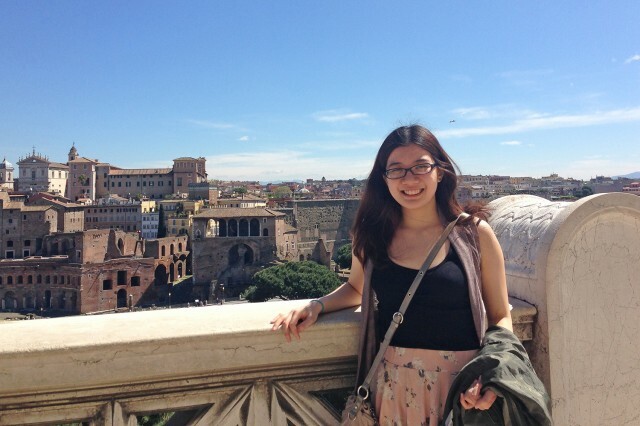 Elaine Tsui ’15, who is currently studying abroad, will speak at the 2014 Connecticut Valley Section-American Chemical Society Undergraduate Research Symposium. This summer, Elaine Tsui ’15 will work on her undergraduate research in the Chemistry Department as an American Chemical Society Fellow. Tsui, who is double majoring in English and chemistry, received the fellowship from the Society’s Connecticut Valley Section. Funding opportunities are available for those with interests in physics, biology, materials science, engineering and medicine. As a fellow, Tsui will conduct self-directed research under the supervision of Albert J. Fry, the E.B. Nye Professor of Chemistry. In 2013, Tsui worked with Fry as a Hughes Fellow and studied “Andodic Oxidation of 1,1-Diphenylacetone in Various Alcohols.” She will continue this research for 10 weeks under the fellowship. As a fellow, Tsui is also required to give a talk at next year’s Connecticut Valley Section-American Chemical Society Undergraduate Research Symposium. Tsui was initially notified of the opportunity through Professor Fry. With her most recent appointment, Tsui hopes to hone her skills as a chemical scientist. “I’m also hoping that I will be able to gain more familiarity with lab work and the entire process of using different techniques to investigate different questions we have,” she said. 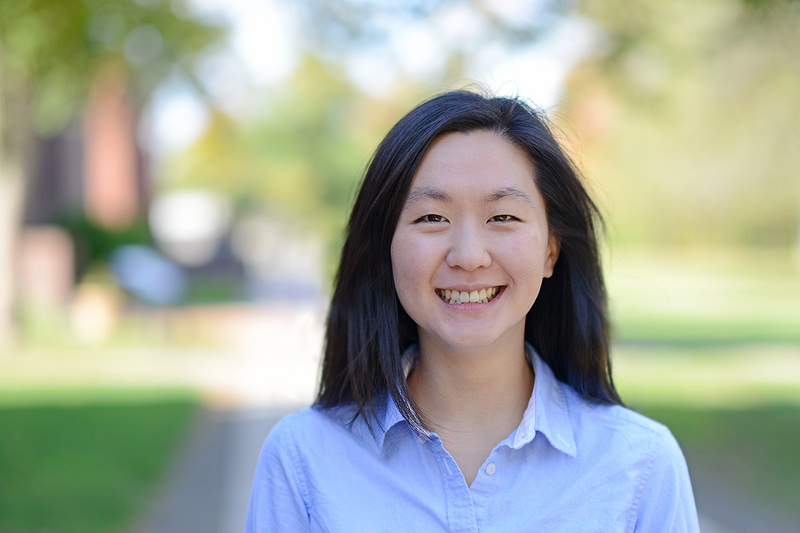 After graduating, Tsui hopes to pursue additional research opportunities in organic chemistry, largely in part to the influence of her alliance with Fry. “I think being exposed to this environment and my own growing interest in my project and what my lab mates are working on have made me realize that I do want to get into a career in research,” she said. Tsui is currently completing a semester abroad in England and will begin her research in June. She’s also planning to submit a paper for review and publication. 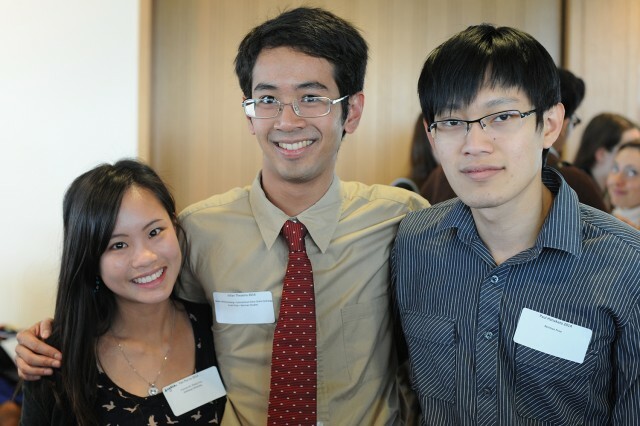 During the Academic Scholarships, Fellowships and Prizes Reception May 7, Yan Pui “Angela” Lo ’14, Julian Theseria ’14 and Paul Hanakata ’14 received honors. Lo received the Holzberg Fellowship for psychology research and the Frances M. Sheng Prize for Japanese language. Theseria received the Baden-Württemberg Connecticut Sister State Exchange Award and the Scott Prize for German Studies. Hanakata received the Bertman Prize for physics research. Wesleyan hosted the Academic Scholarships, Fellowships and Prizes Reception for students May 7 in Daniel family Commons. “We gather today to honor students who represent the highest ideals of Wesleyan University―intellectual curiosity, academic excellence, creative expression, leadership, and service. While celebrating these recipients of awards, prizes, and scholarships, we also honor and thank alumni and friends whose generous contributions make these prizes possible,” said Ruth Striegel Weissman, provost and vice president for academic affairs. Established by the Class of 1967 and awarded to the graduating senior who has exemplified those qualities of character, leadership, intellectual commitment and concern for the Wesleyan community shown by Victor Lloyd Butterfield, 11th president of the University. Rachel Sobelsohn ’17, at right, was the recipient of the Susan Frazer Prize. The prize is awarded to students who have done the most distinguished work in the elementary and intermediate French language sequence. The gift of George Storrs Chadbourne, Class of 1858, to that member of the first-year class outstanding in character, conduct, and scholarship. Established in 1966 by Russell T. Limbach, professor of art, in memory of his wife, Edna Limbach. Awarded annually to the student who has contributed the most imaginative, generous, thoughtful, and understanding social service to the people of the City of Middletown and/or the Wesleyan community. The gift of undergraduates in the Class of 1943 in memory of fellow students who made the supreme sacrifice in the Second World War, to the members of the junior class outstanding in qualities of character, leadership, and scholarship. 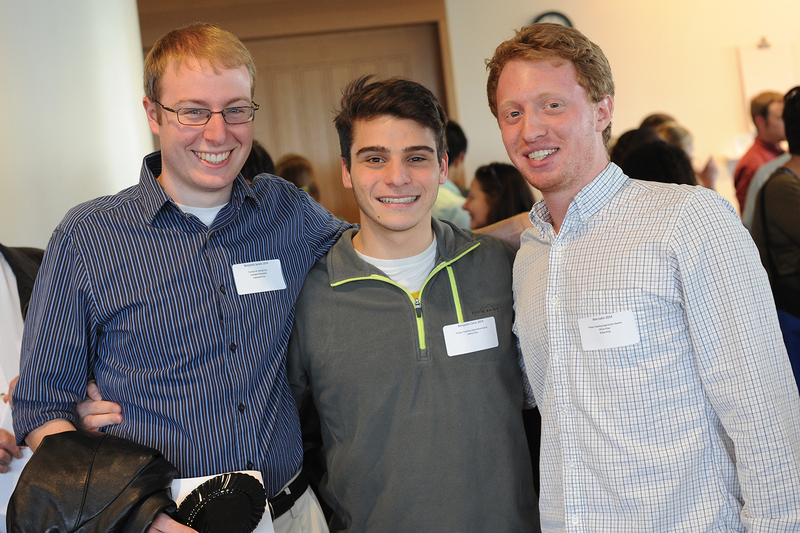 Pictured are, at left, Benjamin Jacobs ’14, Benjamin Carus ’14 and Alex Iselin ’14. Jacobs received the Sheng Prize, a Fulbright Fellowship and the Hallowell Prize. Carus received the Plukas Teaching Apprentice Award and White Prize. 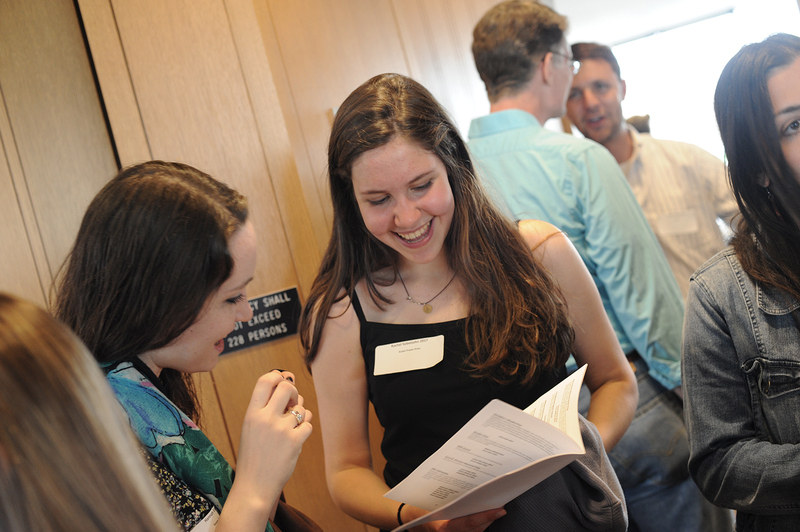 Iselin ’14 received the Plukas Teaching Apprentice Award, Wilde Prize and White Prize. Established in 1992 by a gift from the Grass Foundation, this prize is awarded to an outstanding undergraduate in the Neuroscience and Behavior Program who demonstrates excellence in the program and who also shows promise for future contributions in the field of neuroscience. Established by Wesleyan alumni and awarded to a senior who has demonstrated special aptitude in the history of art and who has made a substantive contribution to the major.